If your idea is to repair Outlook PST files but do not know how, do not worry we have got you covered. We at Shoviv, serve you the service of Outlook PST Repair Tool which can manage all tasks associated to PST repair. It can detect and scan the corrupt PST files on its own, repair them, and restore them with their data properties intact. It comes with easy return policy and license is delivered quickly via email. If you want high-quality results in PST Outlook repair then you must choose a high-quality tool. The software which meets all your needs and provides unprecedented high-quality features is Outlook PST Repair Tool. Its features allow the users to retrieve their lost or deleted mailbox items, and to later export them in multiple formats. With this PST Outlook repair software, you get the comfort of repairing the files irrespective of their size. It instantly scans and lets the user recover PST files without file size limitations. After a specified size, you can also split the output PST files. With this software, you can repair Outlook PST files irrespective of their number as well. It adds multiple files at once and repairs the Outlook PST items. It does all this while maintaining the data in its intact form. Now it would indeed be a relief to preview items before you repair PST files. We provide you with the facility to view the added source mailbox folders. This enables the user to view the list of folder items in item list. In the item preview, one can view item body, item property, recipient list and attachment files. This feature has been added by this PST Outlook repair software for the sheer comfort of its users. Using this feature, one can search particular PST files using criteria like- CC, BCC, subject, To, from, dates etc. It also allows search on criteria like read and unread messages, attachment type etc. The powerful scanning feature of this PST Outlook repair tool helps to scan and recover even permanently deleted files. Also, one can view all of those items in preview pane before restoring them. Even deleted attachments can be restored using this facility. Needless to say, it is quite a powerful and useful feature provided by this PST repair tool. This PST Outlook repair tool also provides the option of saving recovered PST items to the webmail server. This means that the recovered PST files can be saved in mail portals like Gmail, Yahoo, Google Apps, AOL and many more. The recovered PST files can be exported to Outlook as well. 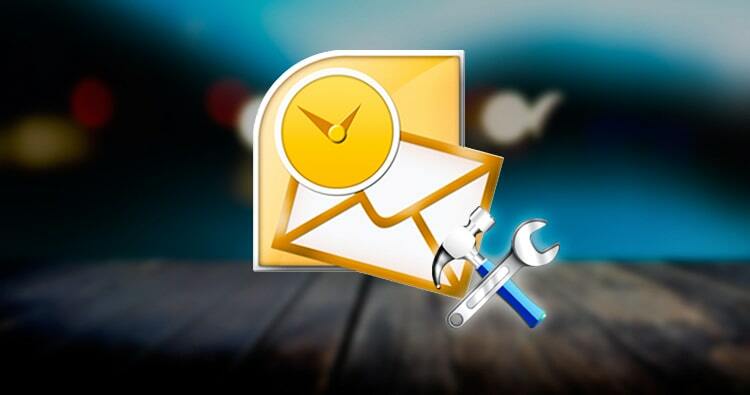 All one needs to do is create the IMAP/POP profile in Outlook and configure them accordingly. Using this software you can not only repair Outlook PST files but also export the files to multiple mail servers. So you can export the recovered files into various email servers such as Live Exchange, Office 365, Novell GroupWise and Lotus Domino server. Using this feature one can export the complete mailbox with its entire contents- emails, contacts, attachments, to-do list etc. and save them using selective filter choice. The people using Office 365 configuration can have their files recovered in their Office 365 user account after the PST repair. One just has to choose Office 365 as the saving location while performing PST repair. Global admin right and other Office 365 access rights must be available to the user to perform this task flawlessly. This feature allows the filter option before saving the files. After the PST Outlook repair, one can save the recovered files to whichever format they prefer. The options this PST repair tool allows for the storage of the recovered files are- EML, MSG, RTF and HTML formats. This PST repair tool works meticulously to save all kinds of data items. It restores all email item properties so that no data is missing. It restores everything from CC, BCC, Contacts, attachments, tasks, Calendars, to/from, date/time etc. So the user is guaranteed to get their data in the intact form without a single loss. In addition, this tool also keeps the folder hierarchy intact. Along with all these features in PST repair, one can opt a full license at an affordable price. Additionally, the tool comes with instant delivery, so offer it right now. In case of unsatisfactory experience, you can always rely on the money-back guarantee. Also, in case you would like to get familiar with the features before buying them, be sure to try out our free trial version of the tool. It lets you use 25 files in one go. Let us know how your experience was.